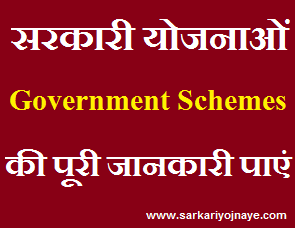 UPSSSC has uploaded VDO/ Gram Panchayat Adhikari Written Exam Admit cards on its website. Download UP VDO Admit Card 2018 from link given below…..UPSSSC has announced VDO/ Gram Panchayat Adhikari Exam Date & release Official Notice. 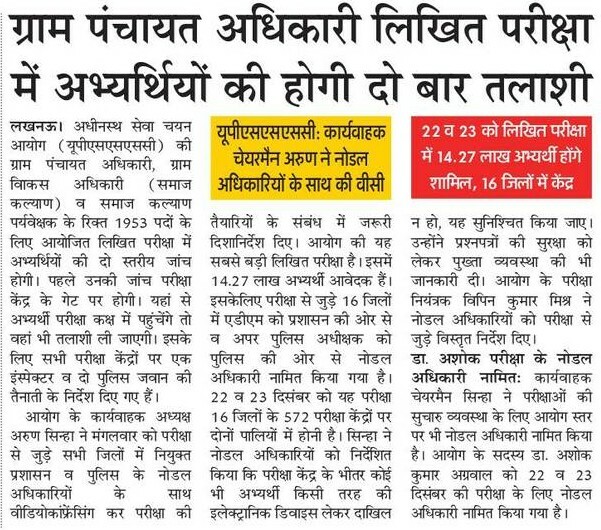 More than 14 Lac Candidates has applied for VDO Posts. VDO Exam will be conducted in December, 2018. UPSSSC has uploaded Official Syllabus & Exam Pattern for VDO, Gram Panchayat Adhikari Exam 2018. Download Official Syllabus from link given below…. Now Computer Degree & Diploma is approved for various Group B & Group C Posts. Earlier only DOEACC/ NIELIT Certificate was acceptable for Group C Posts. Read Full News from Image given below……..
Big News !! Total 14.33 Lac Candidates has applied for 1953 Vacancies for Gram Panchayat Adhikari & VDO Posts. There are 733 Candidates for one post. Read Full News from Image give below…..
Uttar Pradesh Subordinate Services Selection Commission recently has invited Online Applications for 1953 Gram Panchayat Adhikari, Gram Vikas Adhikari (VDO), Supervisor Posts. Candidates who are looking forward to grab this Job Opportunity for VDO Post, must start prepare for this Important Exam as there is no interview so selection will be based on Merit of Written Exam. Selection Process : Selection to the Post of Gram Panchayat Adhikari, VDO will be based on Written Exam. Final Selection may based on merit of Written Exam. 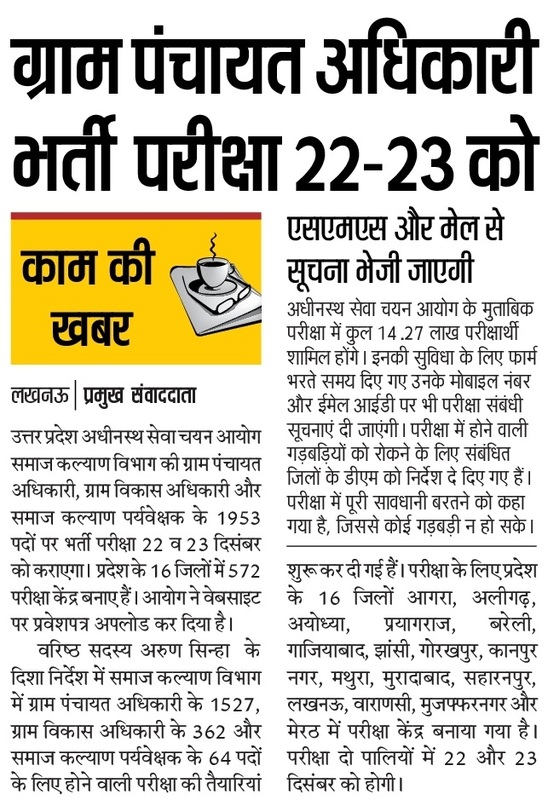 UPSSSC may conduct Written Exam First to Shortlist candidates for Next Process i.e. Document Verification. Written Exam can be conducted in the month of December, 2018. VDO Exam will conduct in two Shifts. 1st Shift/ Morning Shift will be from 10:00 AM to 12:00 PM & 2nd Shift/ Evening Shift will be from 03:00 PM to 05:00 PM. There will be 150 Questions in Exam comprising of 300 Marks. Time Duration wll be 2 Hours (120 Minutes). Candidates First have to visit Official Website to Download UPSSSC VDO Admit Card 2018. On the Home Page, You will find Link to Download Admit Card for Sammilit Gram Panchyat Adhikari, Gram Vikas Adhikari and Samaj Kalyan Prayveksh (Samanya Chayan) Pratiyogitatmak Pariksha 2018. On Clicking that Link You will be redirected to Admit card Download Page. On that Admit card Download Page, You can Download Admit cards by using your Credentials of registration number & Date of birth. Candidates who don’t have their registration number, they can check their registration number from “Forget registration Number” Link. Candidates can download their respective admit card & Take Print out of Admit card. Aspirants need to have a regular watch on UPSSSC Website. 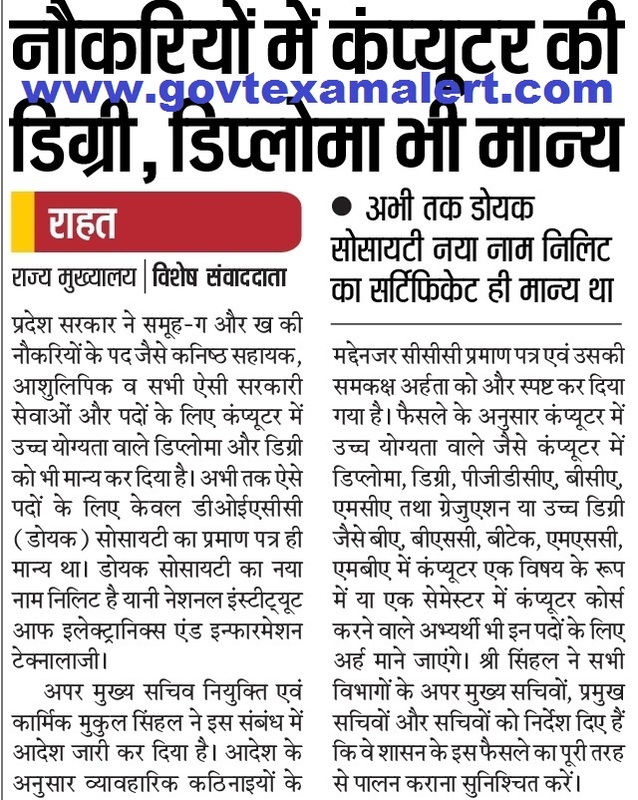 UP VDO Admit Card 2018 Latest News Updates will also available on www.govtexamalert.com. So Bookmark this Page (Press CTRL+D) & get regular UPSSSC Recruitment News Updates. You can leave your query regarding Admit Card in the Comment Box. We will try to be responsive. Leave an email at Disha@govtexamalert.com for Assistance. Hi Vinod, get result updates from this link..
Hi Rajan, Exam may conduct under offline mode. Upsssc gram vikash adhikari ki exam date kab hai..?? Get Details of Nalkoop Operator Exam from link given below..